Great job. Thanks for doing the club! I loved MY BEAUTIFUL WORLD! "Champion of causes not yet won" is my new motto in life as of this morning. Thanks for reviewing! What an amazing story! And a great review. Thanks for recommending and bringing to our attention. Great review, Barrie. What an interesting woman she is! I'm not surprised that it read more like a novel since Sylvia Mendoza started out as a romance writer! Lovely woman. 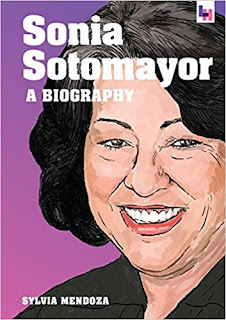 I am a big fan of Sotomayor too. It sounds like a good book, although hard to believe anyone would apply to Harvard after watching Love Story. As a joke, it's screened for the new freshman on campus. Thanks for hosting the book review club! Indeed. And I saw her interviewed by Charlie Rose a few months back. What a fascinating life story... and a sense of humor.